Connie Money of Rumford, a municipal recycling coordinator by day, also enjoys writing and talking about how we can all help our environment. 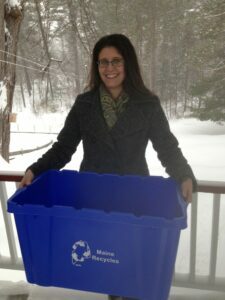 Connie Money of Rumford is the recycling coordinator for the Northern Oxford Regional Solid Waste Board. She’s worked from home and in the community for NORSWB since last summer to educate and promote recycling and waste reduction in the community and teach about the environmental benefits of doing both. The NORSW transfer station serves the towns of Byron, Dixfield, Mexico, Peru, Roxbury and Rumford. Aside from her work for the board, Money also writes the column Trash Talk for the Rumford Falls Times. In her column, she shares her ideas about recycling and waste reduction, and she says she’s always looking for new opportunities to recycle, reduce and reuse items. “The best each of us can do is set a good example (by recycling and reusing items) and communicate (about it),” she says. 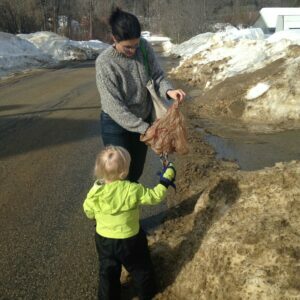 Money, 33, grew up in Dixfield and moved to Rumford four years ago with her husband, Patrick Bulger, and her 3-year-old son, Oliver Bulger. When did you first become interested in recycling? I first became interested in recycling as a child. My mother grew up in a time when people couldn’t afford to be wasteful, and she raised me and my siblings to be mindful of and grateful for all that we have and use. She loved the outdoors and passed that along to me, too. The two ideas, having an awareness of your environmental footprint and caring about nature, led to my interest in recycling and all things related. I committed to recycling 11 years ago, when I moved to the town of Mexico and found out there was curbside pickup available. In recent years, I’ve become more disciplined with it, recycling, reusing, donating and composting all that I can. educate and promote recycling and waste reduction and the environmental benefits of both. I’m trying to get people to recycle more and waste less. I’ve been writing a weekly column for the Rumford Falls Times and managing a social media page. Check it out at facebook.com/RecyclewithME. My goals in this position include trying to get all of the local schools to recycle all that they can. This spring, for Earth Day April 22), I will be calling on everyone to do their part to clean up litter. Also, when plans are finalized, I will advertise the Household Hazardous Waste collection event. This position has been a learning experience and an opportunity to make a positive change in the community and the world. What are some major reasons why we should recycle our plastic and other items? We need to recycle as much as we can because the material we recycle is used to make new products, limiting the need to source raw materials from nature. For example, when we recycle paper, it is used to make new paper, decreasing the amount of trees that have to be cut down. Plastics are a huge problem in terms of pollution right now, as they are made from fossil fuels and are not biodegradable. From the pollution created from oil drilling and refining, to the processes involved in manufacturing different kinds of plastic products, to the plastic trash that is littering all corners of the Earth, plastics are taking their toll on wildlife, our health and the future. The problem with plastics is they do not decompose. Instead, they break down into smaller and smaller pieces, called “microplastics,” to be consumed by animals and humans and wreak havoc on our body systems. Plastic has revolutionized the world, on various levels, but it’s time we limit its use to sheer necessity, such as its uses in the medical field, sanitation and chemical storage. Efforts need to focus on the study and development of biodegradable plastics and the phasing out of single-use ones. Recycling only works if people are doing it. So please do it. Avoid single-use plastics as much as possible, like bottles, bags, straws and to-go cups and containers. If we can recycle and limit our reliance on plastic, we can hopefully start to reduce the 9-billion-ton plastic footprint that is crushing ecosystems all over the world. Recycling is also good for the local economy. The material collected as recyclables is sold to vendors who will reuse it and creates revenue for our towns. What are some of the latest items that can now be recycled at the NORSW transfer station? Anything new happening there? The latest additions to the transfer station in Mexico are bins for clothing recycling and food waste collection. Apparel Impact, a textile recycling company based in New Hampshire, has provided our area with multiple bins for collecting used clothing and accessories. Along with the bins at the transfer station, they also placed a bin outside of Marden’s in Rumford and one at the SUDSury laundromat in Dixfield. Compost bins are located at the transfer station for all types of food waste. Are there some creative things or different things that you do with recycled items? I can’t say that I’m creative or different with my recycling, but I always try to give things a second life. Something I reuse frequently is containers. I love house plants for their beauty and to improve air quality, and in the spring I need lots of containers to start seeds for the garden. Gallon jugs and creamer cartons with the tops cut off, yogurt tubs and produce containers become planters and seed-starting containers. Glass jars are used for small plants and to propagate others. Containers from groceries hold leftovers and other things. Why buy new food storage containers, when you already have perfectly good ones? I make body care and cleaning products, and reuse containers for this also. I have a collection of old broken jewelry that is destined to become a wind chime. Creating art is a great way to recycle things that would otherwise go to the landfill. Does the transfer station have a program with the schools in the area for composting and/or recycling? The NORSW transfer station serves the towns of Byron, Dixfield, Mexico, Peru, Roxbury and Rumford, so the schools in those towns are welcome to use the facility. Some of the schools have recyclables picked up, while others drop it off. Some are doing great with recycling, and others need help. The common barriers seem to be effort and funds. Even in a school where staff and students are willing to take responsibility for the collection and sorting of recyclables, there are no funds available for them to purchase bins for roadside pickup. I’m working to overcome these barriers and accomplish our recycling goals. I am always looking for new opportunities to recycle, reduce and reuse. The best each of us can do is set a good example and communicate. Please, contact me with ideas or questions. My work is for the community, and I love the feedback. To contact Money, email her at [email protected] or go on her Facebook page: Recycle with ME.